Alain Boublil and Claude-Michel Schönberg’s Les Misérables, based on Victor Hugo’s novel, has, since the Paris premiere in 1980, established itself as one of the greatest musicals of all times. The original London production, premiered on 8 October 1985 at the Barbican Arts Centre and a month later transferred to the Palace Theatre, has been running continuously ever since, from April 2004 at Queen’s Theatre. It celebrated its ten-thousandth performance in January 2010 and is the longest running production ever. Wermland Opera produced it in 1996 and was the first theatre in the world that was permitted to make its own concept. Now, twenty years later, they offer a new concept again and with new orchestrations by Christopher Jahnke. Karlstad Theatre, built in 1893, is a small, intimate venue, seating just under 400 visitors and the stage is rather narrow which calls for compact sets. The entire musical plays in a tubular room, which sometimes gives associations of looking through the barrel of a rifle. The depth of the stage allows for easy shifts of scenery, the many tableaux gliding smoothly over in the next. Having seen the original production at the Palace Theatre many years ago from one of the balconies, I was right from the outset much more deeply involved in the performance in Karlstad thanks to the closeness – I felt in the midst of the proceedings although I was seated at the rear of the stalls – but just as much thanks to the vividness of the production and the commitment of the actors. Director James Grieve, specialist in contemporary drama, has chiselled out true, believable characters – yes, there is indeed an impressive gallery of individuals in this story and in cooperation with a largely young cast of well-schooled actors willing to immerse themselves in their characters Grieve has created a many-faceted but cohesive canvas of real human beings. The basic story is dark and frightening. We are among the lowest categories of people, at the bottom of society: criminals, whores, outcasts. But we also encounter moral, responsibility, friendship, courage, belief in the future. The sum of all these ingredients is one of the most human, yes humanist, stories that ever was shown on a musical stage and it is easy to understand the popularity of Les Misérables, which has not faded away with the passing years. It speaks to the hearts of people. And seeing it again in this fresh production is a privilege. The music also feels fresh and the new orchestrations add a special sheen. Wermland Opera Orchestra, although small in number, are a splendid body, something I pointed out in my review of Die tote Stadt some months ago (review). I don’t know how much – if at all – amplified the orchestra is but the sound is definitely hefty for a 26-piece band. Anyway it is a well-integrated sound that fills the hall impressively. When it comes to the singing I am even more impressed by the general quality of the voices. Here are marvellous voices also in relatively small roles and several of them are also covers for the main roles. In a musical where ensemble scenes are of such importance this is a real asset, and rarely have I heard such intense and powerful contributions, as for instance in Do you hear the people sing? They are of course all amplified which means that also when they turn their backs to the audience the sound is as strong and clear as when they face the listeners. For someone accustomed to unamplified voices this is a bit disconcerting. But I have no complaints at all about the actual sound. Everything is very well engineered. Also the children’s voices come over well and I was deeply moved by their contributions. In the central role as Jean Valjean, the charismatic Christer Nerfont is superb. He has been one of the leading musical artists in Sweden for twenty years and actually made his professional debut in Les Misérables at Wermland Opera in 1996. 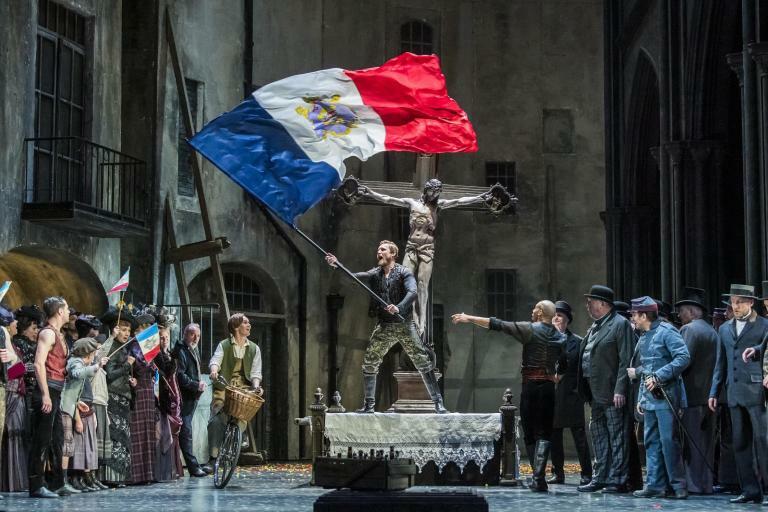 Then he was Feuilly, one of the students, but he was also cover for Valjean and appeared in that role as well, so this production is in a way a return to his roots as artist. His high baritone is an impressive instrument, voluminous but also marvellously beautiful in the intimate numbers. Valjean’s antagonist, police inspector Javert, is played by Philip Jalmelid, stately, dark voiced and formidable both as actor and singer. He has also appeared in Les Misérables before, in Malmö some years ago, but then as Marius. The confrontations between these two are dramatic high-spots. Direct from his finished musical education at The Academy of Music and Drama at the University of Gothenburg, comes David Alvefjord, who celebrates his diploma with the role of Marius. Lanky and sensitive he creates a credible portrait of the young student and he is clearly one to watch in the future. Cecilie Nerfont Thorgersen – yes, she is married to Christer – also made her debut back in 1996 in Les Misérables and now repeats her role as Fantine. An experienced actor she is just cut out for the role and her scenes are among the most touching episodes in the performance. Kristin Lidström´s Cosette and Kerstin Hilldén´s Eponine are both lovely in their emotional roles. In the cameo role as the Bishop of Digne, veteran Björn Eduard makes a likeable character. Far from likeable are the characters Monsieur and Madame Thénardier, truly the dregs of society, but Jonas Schlyter and Jenny Norén are masterly at depicting falseness and moral decay. Les Misérables is sung in Swedish – translation by Ture Rangström – and it will play from the end of August until the end of December. “World Class!” wrote one of the morning papers after the premiere. I wholeheartedly agree!